Howard Hughes Medical Institute (HHMI) scientists have found a way to silence (turn off) individual neurons, using optogenetics, which previously could only turn on neurons. Optogenetics is a method used by neuroscientists to study how specific neurons work. They shine LED or laser light on genetically modified neurons (light-activated) proteins (such as channelrhodopsin) that function as ion channels, which then turn on the neurons in which these ion channels are expressed. A molecular analysis of channelrhodopsin’s pore suggested that swapping out certain negatively charged amino acid residues lining the pore with positive residues could reverse the electrostatic potential of the channel, making it more conductive to negatively charged ions such as chloride. 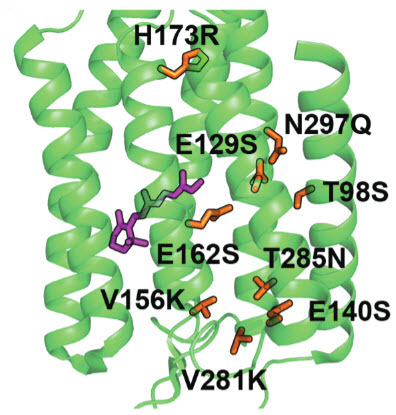 Deisseroth’s team made a final mutation to a cysteine residue in iC1C2 that makes the channel both bi-stable and orders of magnitude more sensitive to light. When activated by blue light, the mutated channels remain open for up to minutes at a time, while exposing the channels to red light makes them close quickly. This level of long-term control is useful in developmental studies where events play out over minutes to hours. The long times for channel opening also mean that neurons can essentially integrate chloride currents over longer time scales and, therefore, weaker light can be used to inhibit the neurons. Increased light sensitivity translates to less light-induced damage to neural tissue, the ability to reach deep brain structures, and the possibility of controlling brain functions that involve large regions of the brain. “This is something we’ve sought for many years and it’s really the culmination of many streams of work in the lab — crystal structure work, mutational work, behavioral work —all of which have come together here,” Deisseroth says. Using light to silence electrical activity in targeted cells is a major goal of optogenetics. Available optogenetic proteins that directly move ions to achieve silencing are inefficient, pumping only a single ion per photon across the cell membrane rather than allowing many ions per photon to flow through a channel pore. Building on high-resolution crystal-structure analysis, pore vestibule modeling, and structure-guided protein engineering, we designed and characterized a class of channelrhodopsins (originally cation-conducting) converted into chloride-conducting anion channels. These tools enable fast optical inhibition of action potentials and can be engineered to display step-function kinetics for stable inhibition, outlasting light pulses and for orders-of-magnitude-greater light sensitivity of inhibited cells. The resulting family of proteins defines an approach to more physiological, efficient, and sensitive optogenetic inhibition.